Elizabeth first began her Denture Career in 1981 in her native Poland. After moving to Canada in the late 80's, Elizabeth continued to work in a local dental lab. She furthered her education at George Brown College, receiving her Denturism Diploma and going on to receive her license to practice from the College of Denturists of Ontario. Yearly continuing education courses for herself and her staff ensure that the office is up to date with all the latest technologies and ground breaking research. In March 2005, Elizabeth opened the doors of Quinte Denture Clinic serving the people of Belleville, Trenton and surrounding areas ever since. In October of 2011, the clinic moved to a larger, newly renovated location to accommodate a new associate and serve the public better. 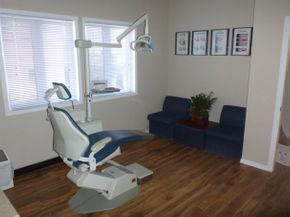 With more man power, wheel chair accessibility, and a more spacious, comfortable waiting room, the new office is geared to provide the utmost in professional, yet friendly service, from the moment you sit down in the consultation room, until the moment you walk out the door, ready to greet the world with a bright smile.